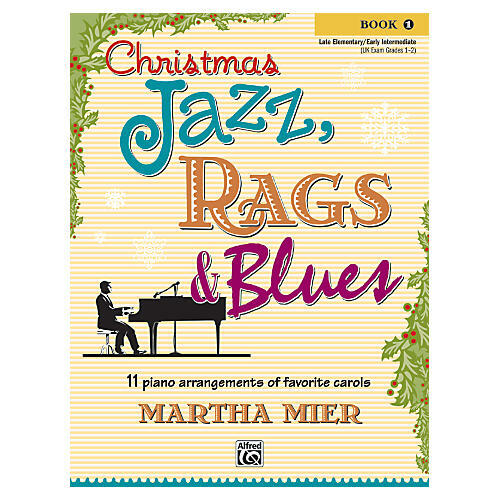 A softcover songbook of favorite carols arranged with a jazz feel for late elementary to early intermediate pianists. Alfred's Christmas Jazz, Rags & Blues Book 1 is a collection of 11 piano arrangements to inspire students with the syncopated rhythms and rich harmonies of jazz. Detailed articulation, dynamic and pedal markings create a thoughtful and thorough performance. Titles: Away in a Manger * Deck the Halls * Fum, Fum, Fum * God Rest Ye Merry, Gentlemen * Good King Wenceslas * Jingle Bells * Jolly Old Saint Nicholas * Joy to the World * Toyland * Up on the Housetop * We Three Kings of Orient Are.